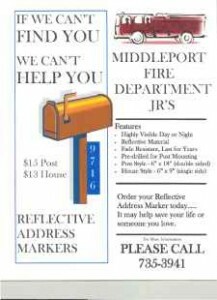 Middleport Volunteer Fire Company » If we can’t find you…we can’t help you! If we can’t find you…we can’t help you! While you may know exactly where you live and your house number may seem obvious to you….when you need help, someone needs to find you to be able to help you. This is a very hard job during inclement weather and at night. Your house number should stand out and be contrasting to it’s background and if possible – be reflective. Numbers should be in digit format not in written script and preferably 3″ high. Our Jr. Firefighters have a program to assist you. They offer reflective address markers for your house and for your mailbox post. ($13.00 & $15.00 respectively). The signs are custom numbered to your request. All proceeds benefit the Jr. Firefighter program. Please call 716-735-3941 for more information. It may help save your life or someone you love.